Invertebrates, are important ecological species that perform a variety of ecosystem services. They are critical links within the vast food chains and webs that exist in the ecosystem, for example pollination, seed dispersal, pest control, bio-indicators and as a source of food of other important species. In recent years there have been sharp declines in invertebrates in parts of Ireland – there are many species of conservation concern. Our biodiversity is under threat by intensification of agriculture, habitat loss, fragmentation, traffic mortality, poisoning and other human activities. People can support biodiversity in their own communities and gardens by creating habitats for invertebrates using waste materials. The purpose of our Bug Hotel bookmark is to demonstrate how educate visitors on what biodiversity is, why biodiversity is important, why biodiversity is declining in Ireland and what can be done to support and conserve biodiversity. The basic structure of the Bug Hotel was constructed using untreated wooden pallets to create a stable tower approximately 1m high. Each pallet was secured to the pallet below it, to create a stable structure. 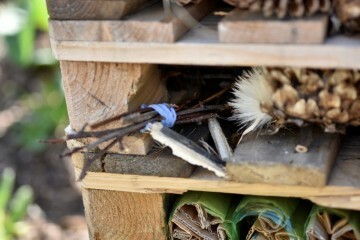 The top of the Bug Hotel consists of a shallow framed box bed, where nectar rich plants were planted. The gaps in the pallet tower structure are filled with a variety of materials which created a range of microhabitats for invertebrates and other species, such as soil, stones, bricks, wood, bark, dead wood, twigs, leaves, moss, wooden blocks with drilled holes, straw, hay, plants.